Yesterday they announced on facebook that on Monday the Vanguard communities on facebook and twitter will be able to follow the CEO of the company, Bill McNabb, ask him their questions and “see what his typical day is”. Earlier this week, Vanguard’s social media team teased their facebook and twitter communities with this post: “On Monday, January 23, we’ll be hosting a special event on our Facebook page that we think you’ll enjoy! Any thoughts on what it could be?”. You can now find more information on the Vanguard blog. The social CEO / CxOs is one of my favourite topics. My team is focused on spotting any social media activity from the Senior Management of the leading financial institutions worldwide. In the last couple of years, we put together a list of Senior Executives in banking, insurance, finance on twitter, I contributed toa live chat with the former CEO of first direct, UK most recommended bank. I also covered the almost daily personal involvement on twitter or blogging from Senior Leaders like Peter Aceto – President and CEO at ING Direct Canada or Jean PHILIPPE – Managing Director at Credit Agricole Pyrenees Gascogne (France). Needless to say that I am eager to see how Vanguard’s initiative will work out on Monday. First of all, it reminded me of a similar initiative launched by Nigeria’s GT Bank in September 2011. I invite you to check my article ‘The Video Response of a Bank’s CEO to Customer Questions on Facebook‘. This initiative was not as ambitious as Vanguard’s, considering that GT Bank didn’t promise a live access to Segun Agbaje, its CEO. 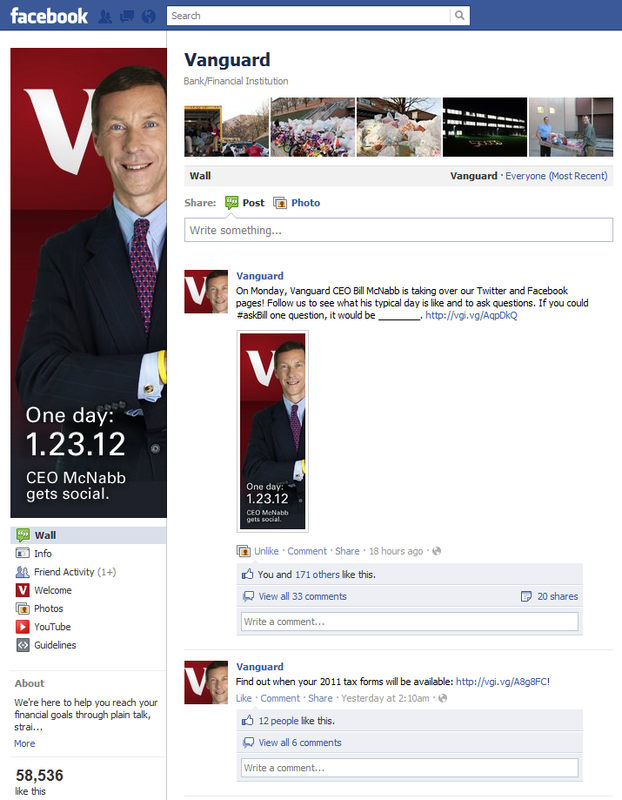 Vanguard has been one of the earliest adopters of social media in the heavily regulated finance industry. They have a few facebook pages and twitter accounts, and their investment experts regularly share their views on the Vanguard blog. The investment management fim claims to have“a total social media audience of about 1 million people”. This is transparency and engagement in action. It is a pleasure to see CEOs and CxOs demonstrating their understanding of social media and engaging with their company’s communtiies even if only a couple of times a year. Kudos here to Bill for accepting to be closely followed and highly visible during one, surely very well rehearsed, day. And congratulations for John for successfully articulating the benefits of social media internally and convincing the Senior Management and The big boss to take part. * who will follow Bill and “be his voice” online on the day? * Will all the promised pictures and personal investing perspective will be shared “live” or broadcasted from videos and personal opinions pre-tapped and re-worded by the CEO office? * How will they capture the questions, identify the most relevant ones and answer them on the day? We just know that the social media team is planning to generate some buzz on twitter, asking people to submit general financial questions under the hashtag #askBill. Stay tuned on Visible Banking, we will assess the success of this intiative next week. I would love to hear your thoughts on this topic and get your answers to the following questions: how active is your CEO on social media channels? Any members of your Senior Management or the Board of your financial institution blog or tweet?